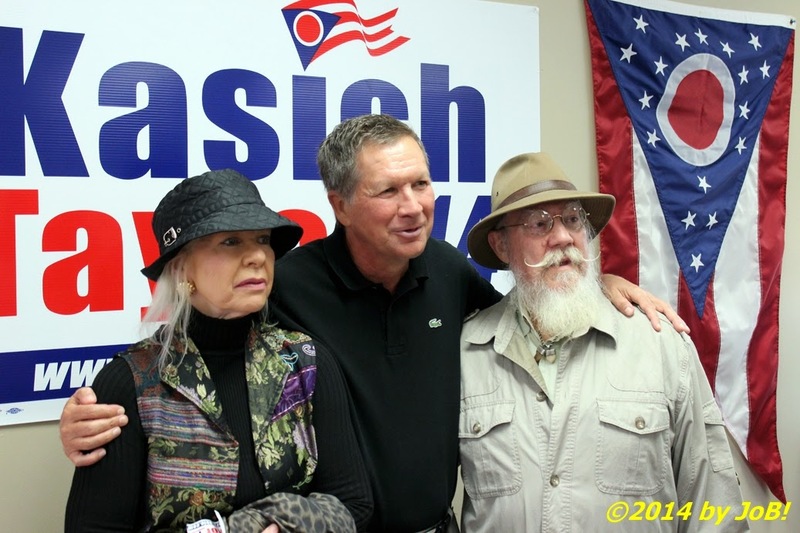 Ohio governor John Kasich poses for a photograph with supporters at a London, Ohio "Get Out the Vote" appearance Friday afternoon. Although enjoying significant statewide polling leads over his Democratic opponent, Ohio governor John Kasich visited three locations on Friday afternoon in a whirlwind "Get Out the Vote" offensive for his own as well as other Republican candidates on the ballot in preparation for next month's general election. His first stop was in London, Ohio where he visited the Madison County Republican Party headquarters at around 12:30pm and addressed a friendly crowd of around 80 people. About a third of those in attendance were 4th and 8th grade students from the city's St. Patrick's Elementary School and Kasich spent about 10 of the 15 minutes he reserved for remarks to talk with them directly and provide guidance to help each navigate through their young lives. 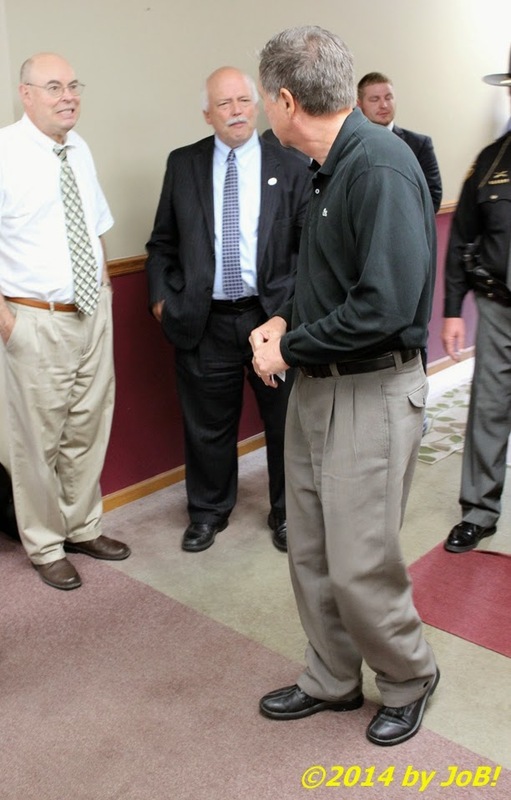 Governor Kasich (foreground) has a quick word with Ohio state representative Bob Hackett (center rear) upon his entry into the Madison County Republican Party headquarters on Friday afternoon. In his remaining time, the governor segued from the students and encouraged the voting-age attendees to help him continue his administration's improvements with the state's economy and jobs by spreading the word and encouraging their families and friends to vote in the upcoming election. "It feels like we're getting our pride back," Kasich told the crowd, "and there's a little spring in our step again." As for his apparently easy contest against Cuyahoga County executive Ed FitzGerald, he warned that "you got to go at it and go all the way through the tape" in order to win. 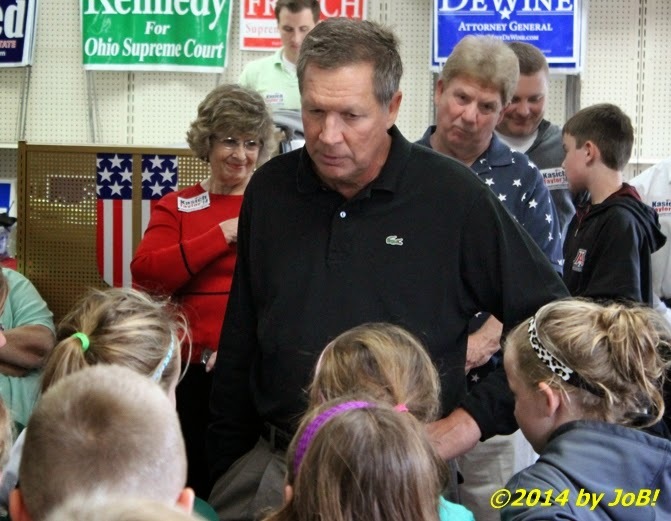 Governor Kasich talks directly to elementary school students at the "Get Out the Vote" event at the Madison County Republican Party headquarters on Friday afternoon. In an almost tongue-in-cheek manner, he asked supporters to put signs in their windows even if it is against community covenants or rules. "Put it up anyway and pay the fine" was the advice Kasich gave as well as urging supporters to affix stickers on the bumpers of their new cars. "Nobody should leave without taking a sign if you want to support us", the governor pleaded before posing for some photographs with the attendees and then making his way to the next "Get Out the Vote" event at Austin's Casual Eatery & Bar in Wilmington. His final stop of the day was a joint appearance with US Senator Rob Portman at the Golden Lamb Restaurant in Lebanon. 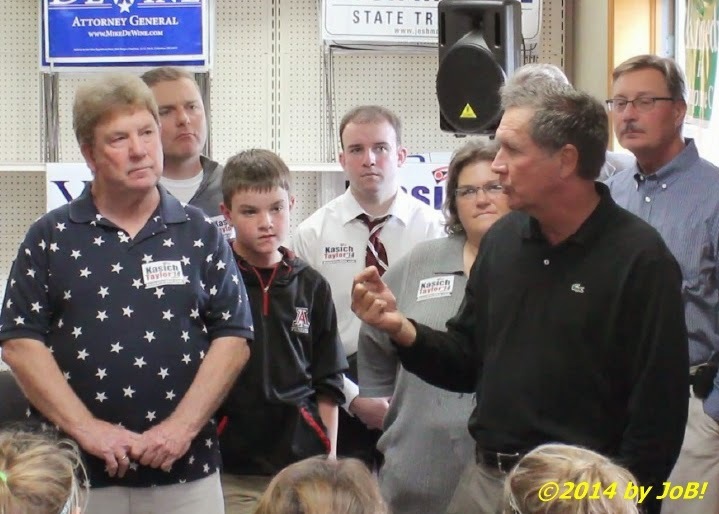 Governor Kasich addresses the gathering at the "Get Out the Vote" event at the Madison County Republican Party headquarters on Friday afternoon. A recently released Quinnipiac University poll puts Kasich ahead of his opponent by 22 percent of likely voters, to include 25 percent of Democrats, and that large margin bodes well for other Republicans running for statewide office with him. If he maintains that sizable lead, his name will most likely be floated as a potential Republican presidential candidate for the 2016 election with Ohio also factoring into that process when their national convention is held that year in Cleveland. 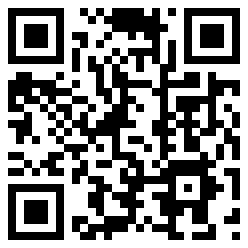 Voter registration for the November general election ends on October 6th and turnout will play a significant role in those immediate and long term plans. 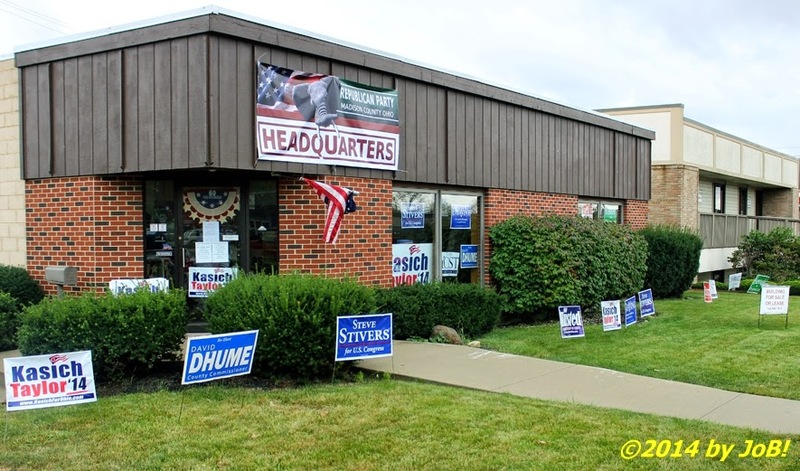 The Madison County Republican Party headquarters was decked out for Governor Kasich's "Get Out the Vote" visit on Friday afternoon. 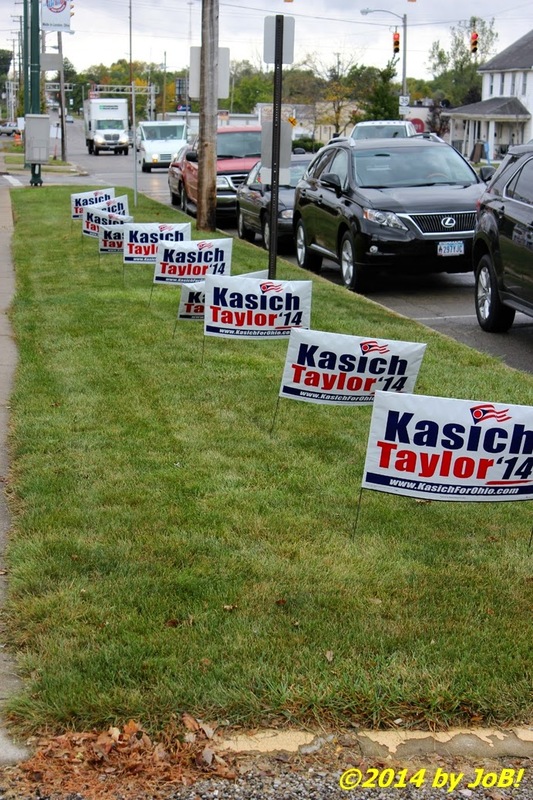 Yard signs decorated the road frontage outside the Madison County Republican Party's High Street headquarters building in preparation for Governor Kasich's "Get Out the Vote" visit on Friday afternoon. 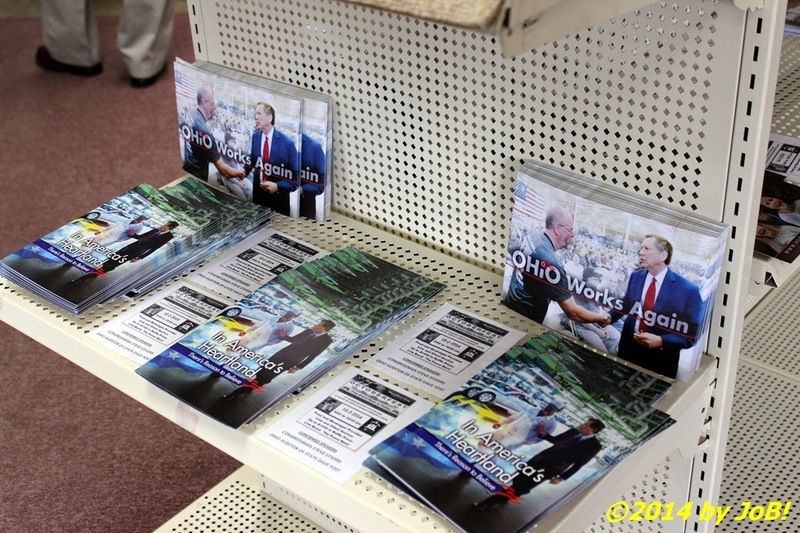 Campaign materials were available to all attendees at the "Get Out the Vote" event at the Madison County Republican Party headquarters on Friday afternoon. 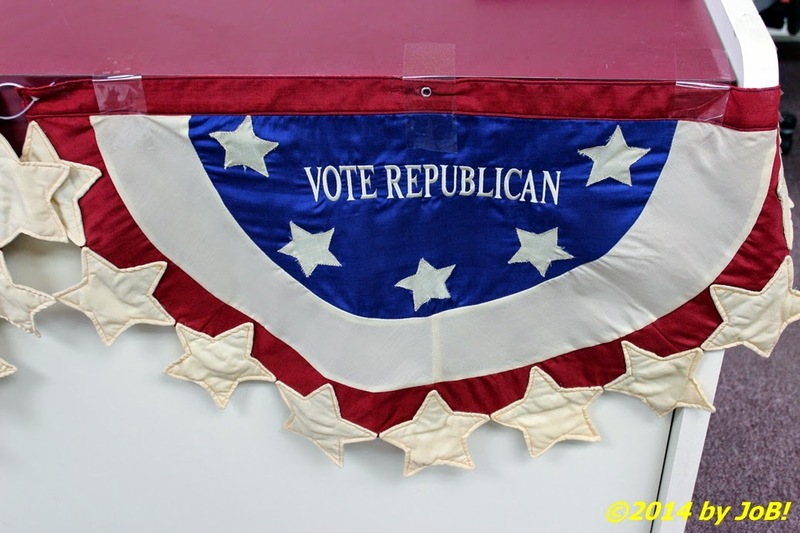 Partisan political bunting on display at the Madison County Republican headquarters during the "Get Out the Vote" event on Friday afternoon.